in the paranormal fantasy Variant Magic. Rochelle: ...Yes, I know I have a girly name, thanks. Kristina: Don't feel bad. There are plenty of guys with girly names: Ashley from Gone With the Wind. Courtney from...uh...Stacy...Well. Thanks stopping by. Why don't you introduce yourself? Rochelle: I am Rochelle LeBeau. I'm twenty-three and looking for love. Rochelle: What? This isn't a dating interview? Can you cut all that out then? Lemme start over. I'm Rochelle LeBeau. The only real “witch” in Chattanooga. At least that’s what I've been told. But there’s a voice in my head telling me I'm something else. A literal voice that I want to give in to. Kristina: I'm interested...but should I be concerned? (laughs) I'm just teasing. Let's get these questions rolling! What do I regard as the lowest depth of misery. Um…probably losing who I am. There’s nothing worse than not knowing who you are. Where I want to live. Ooo! This is a good one! Um, I'd say…Avengers Tower. I'd love to live there! I’d throw lots of parties with Tony Stark and drink mead with Thor. That'd be awesome. Kristina: (high fives) Let's be friends! My idea of earthly happiness. Happiness for me is measured in family and friends. I’m adopted and family means a lot to me. I don’t remember my birth parents, but the people who raised me have never made me feel different or unwelcomed. They're my world. My friends? Well, they've manage to stick by me through my awful “I’m gonna make money playing video games” phase so they're definitely here for keeps. What quality do I most admire in a man? I'd love to own my own magic shop like my parents do. But working at the Comic Compendium isn't bad. I love Ron and all the people who work there. We’re a small shop, but we’re all passionate about the comics and get a lot of business. What I most value in a friend. My best friend, Marcus, is a siren and they’re not known for sticking around. But Marcus has stuck by my side since elementary school. It’s probably why I've been in love with him so long. Wait…can you cut that last part out? My t-shirts. I've got loads of anime and comic book swag. I wear ‘em on a pretty consistent basis. My sister tells me not to wear them on dates, but they’re too awesome not to. The one I'm wearing now is limited edition. Who doesn't want to see that? Um…probably that I don't like to listen and I try to do everything myself. But I do it because it’s safer that way. You mean other than a superhero? Other than that, I’d probably like to actually figure out what I am. I've been told I’m a witch my whole life, even the government has me listed as one, but recently, I'm not so sure. My Gran. She taught me how to use my powers to help people. She’s always been there for me. But I get the feeling she’s hiding something from me. What is it I most dislike? I hate that the government is forcing non-humans to register and get branded. Natural gift I would most like to possess. I’d like to be able to seduce people with my voice like Marcus does. There’s this girl at work that I'm dying to talk to. But the Alpha of the local werewolf pack has his eyes set on me. I'm not complaining, mind you, but I'd like to be able to flirt back without flailing like an idiot. Worried about the monster attacking neighborhoods near me and the local police not doing anything about it. The fact that I'm pretty sure the monster belongs to one of the clients who hired me to track their missing “pet” worries me too. 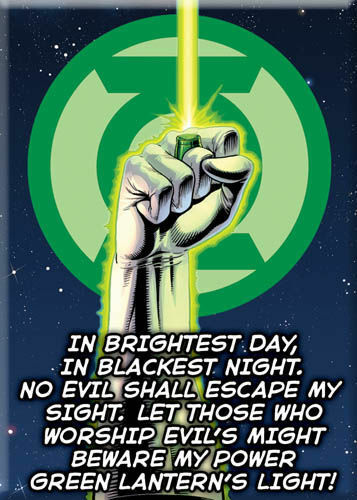 Probably the Green Lantern Oath. It helps me concentrate and you can do almost anything with enough willpower. After all, magic is about using your will to manipulate to the elements around you. Kristina: Whoa! [Readers, he actually said that. I did not make that up.] So, thanks, I guess that means...what, exactly? Rochelle: Oh, I didn't…I mean I wasn't…you know…hitting on you. Unless…I mean, I’m free Friday, if you don't mind things blowing up or catching on fire when I’m embarrassed. Say, you wouldn't happen to like comic books and anime would you? About the book: When Rochelle LeBeau is offered $20,000 to find Andros Nadasdy's missing supernatural pet, he’s wary; Andros is notorious in the underbelly of the supernatural world. And when local werewolf pack leader Jeremiah Pearson urges Rochelle to find the monster before his pack is blamed and executed for the missing children in his neighborhood, Rochelle is eager to solve the case. But with his powers on the fritz, how can Rochelle find the culprit without losing himself? Especially when it looks like his own family has been keeping secrets from him. About the author: A freelance author and comic book enthusiast, Jessica Barlow graduated with a Masters in Writing Popular Fiction from Seton Hill University and currently resides in Atlanta, Georgia with all the peaches and pecans she could eat. She is currently writing about superheroes in love. Variant Magic is her debut novel. For more Jessica, you can find her on Facebook and keep up with her writing on her blog.